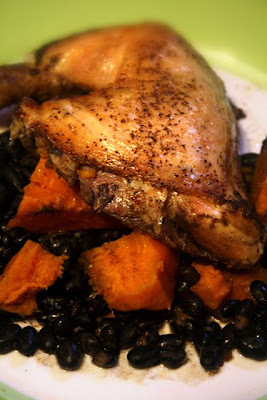 Yams and black beans seem incongruous, but when roasted with dark meat chicken quarters it all works together. I learned this Latin-like dish perusing prose in publications devoted to epicurean delights at my local co-op grocer during a work lunch break. 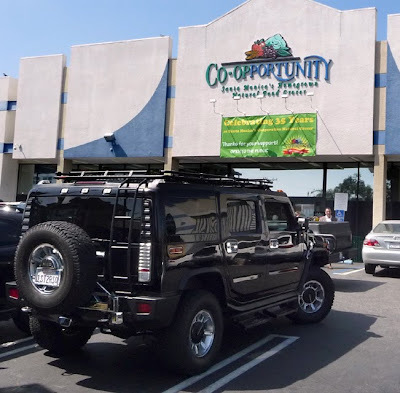 Can you find the incongruity in this picture of my local Co-op? 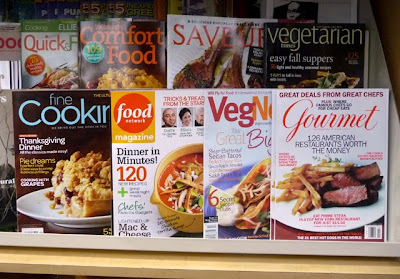 Their magazine rack has everything from Vegetarian Times to Bon Appetit. After sitting in front of a computer screen for 4 hours it is a relief to walk a mile and stand skimming print recipes for 15 minutes. This chef is always on the lookout for interesting cuisine concoctions and will pull from anywhere. This dish stood out for the color contrast and the addition of black beans for a Latin twist. 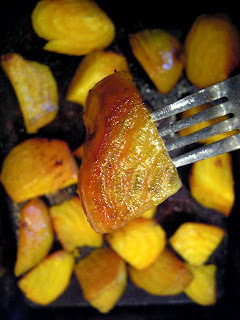 If you have had fried sweet plantains (bananas) at a South American or Cuban restaurant, substituting yams is a less oily way to go -- I love fried sweet plantains but they soak up oil like a sponge. And this is a one-pot entree, so just do a little prep, slap it in the oven, then sit back and relax for a couple of hours. I 'm always looking for an excuse to cook with 69 cents per pound chicken leg quarters (from Albertsons grocery this time); and I need more of the color orange in my diet -- one can only go through so many bags of cut carrots. Yams are always on sale at my local Latin market and large pound-and-a-half cans of black beans cost 99.99 cents at the local 99c only Stores. They are frequently on sale at most any grocery store; and you can substitute blackeyed peas or pinto beans when the price is right. Yams sweeten this dish nicely and hold up well for baking with chicken. Pull the skin off the chicken for a lighter entree. The juices from the bird flavor the black beans and yam to delectable heights. Thanks to Good Housekeeping Comfort Food magazine (the December issue) for this entree idea. You can go to page 26 for the original recipe. I simplified the dish leaving out a few ingredients including cilantro and some sauteed aromatics. 1 large 29 ounce 99.99c can of black beans (or 2 small ones) - reserve liquid. It is ok to substituted with any of your favorite beans. 1 bay leaf (optional) or favorite dried herbs (experiment). Preheat oven to 350 degrees. Drain black beans reserving liquid. Add beans and half a cup of the bean liquid to bottom of a large baking pot. Peel and chop yam or sweet potato into large 2 inch pieces. Place chopped yams on the black beans. 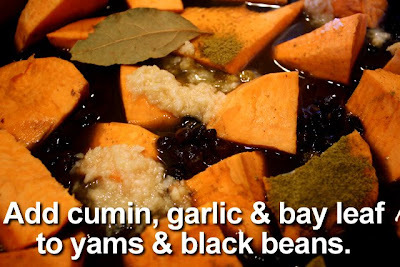 Sprinkle garlic and cumin over yams and beans. Finally place chicken on top and season with salt and pepper; you can remove skin from chicken for a lighter version. Cook covered for 1 hour. A lot of chicken juice will render to steam-cook the yams. Uncover and continue cooking for 45 minutes more so chicken browns and liquid reduces (white meat needs less time, so cook uncovered about half an hour or less). 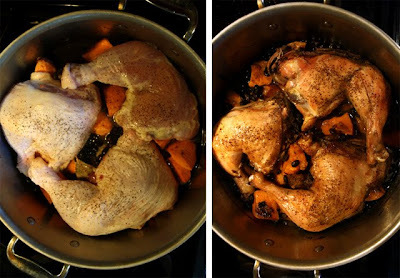 Chicken is done when juices run clear when pierced with a fork in the thickest part. You can add the rest of the bean liquid if you would like more sauce with your meal (the dark meat rendered so much broth that I ended pouring out half of it!). A delicious yam substitution is peeled and chopped yucca, if your local Latin market carries it. Serve with white or brown rice to stretch this budget entree even further. A couple of fresh lime slices are colorful garnishes and a drizzle of lime juice brightens this Latin style entree. 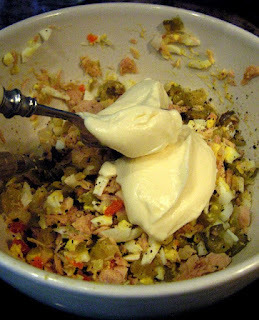 The addition of green olives makes this Tuna Salad unique. I'm called "The Tuna Mouse" at home because of how quickly my wife's Olive Tuna Salad seems to just vanish! The extra briny olives give color and the taste goes well with chopped sweet bread-and-butter pickles mixed into canned tuna -- and made richer with chopped eggs and mayo. This is one delicious concoction that fits snugly into pita bread, makes a great tuna melt, fills a pitted half slice of ripe avocado, or tops a salad with a couple of scoops. Canned tuna is one budget item I always keep stocked. 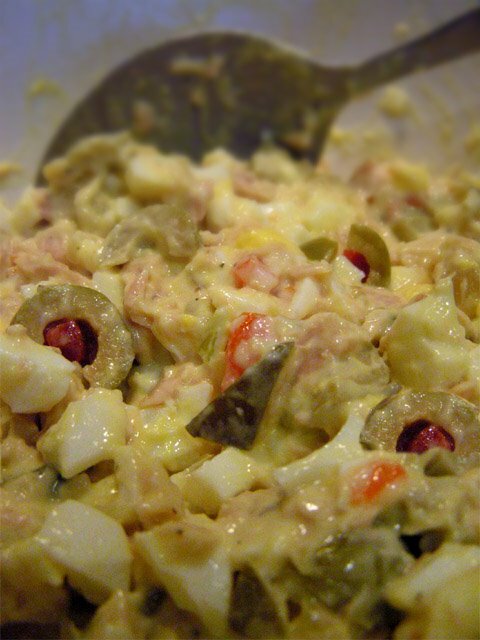 Everyone has a favorite Tuna Salad recipe and this is The 99 Cent Chef's! 2 tablespoons onion - fine chopped. 2 tablespoons green olives - chopped or sliced. 1/4 cup bread and butter pickles - chopped, or sweet relish. 4 tablespoons mayonnaise - okay to adjust amount to suit your taste. 2 boiled eggs - chopped. 1/2 teaspoon dry mustard - or regular Dijon mustard. Celery salt and pepper to taste. Boil 2 eggs for about 10 minutes. Remove eggs from water and set aside to cool. Fine-chop onion. Roughly chop green olives and pickles. Peel and chop boiled eggs. 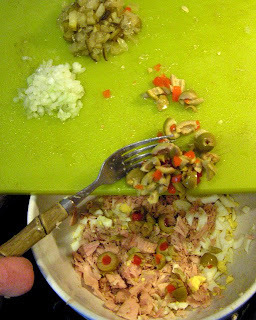 Drain tuna and add, along with chopped pickles, olives and onion, all ingredients in a large bowl. Season with celery salt and pepper, mixing well. Finally add one teaspoon of mayo at a time to desired creaminess. Serve in pita or regular bread. Or how about a Tuna Melt? Just slather Tuna Salad onto bread and top with a slice of cheese. Brown the sandwich with a pat of melted butter in a frying pan. Bitter greens are sweet when The Chef takes over in the kitchen. Slow cooked until tender with a rich pot liquor flavored with beer, vinegar, bacon, onion, garlic and molasses, it's a great side dish loaded with good stuff. 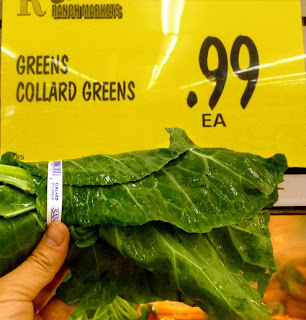 I usually get my cooked greens from Chef Marilyn at Soul Food Express down the street on Crenshaw Blvd., but sometimes I want to go extra cheap and load up my plate. My local Latin market sells collard and mustard greens in 99 cent bundles and two will make enough for 4 servings! My recipe is simple and adaptable, but you do have to slow-cook them for an hour and a half, and the aroma may drive you crazy with anticipation. With greens, the longer you cook them the better. 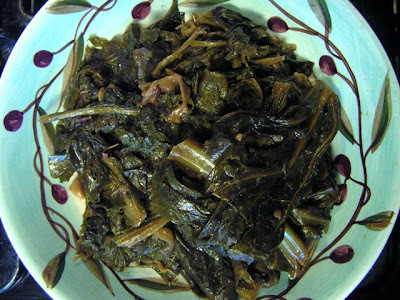 You can cook collard and mustard greens together. This recipe calls for sauteed bacon, but you can keep it vegetarian and leave it out - add half a cup of vegetable broth instead. The Chef likes to cook with beer, and you can use any kind -- dark, malt liquor or light. So get a 24 ouncer from your corner liquor store; get cooking, and save half for yourself! Prepare greens by washing, slicing off tough ends, and chopping leaves into wide strips. In a large pot saute and brown bacon over medium heat, then add chopped onion. Cook until onion is soft, about 5 minutes. Add garlic to sauteed onion and cook for a minute. Pour in beer, vinegar and molasses; bring to a boil. Reduce heat to low and press down greens into pot and cover. Cook for 15 minutes. 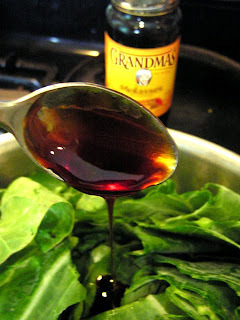 Greens will wilt and shrink the way spinach does. Mix well so greens keep cooking down. Once well mixed, cook for an hour; add hot sauce a little at a time and taste to reach desired spicy heat. 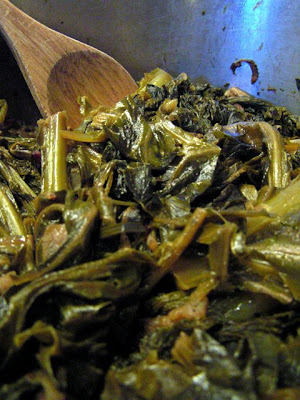 Continue cooking for at least another half hour until desired tenderness of greens are reached. Check greens and add water or stock as liquid cooks out - a half cup at a time. Simplest to serve with red beans, rice and a hot link, or Mom's Jambalaya! 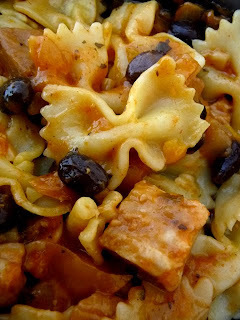 Deal of the Day - Weight Watchers "Picante Chicken & Pasta"
What do you get when you combine chili with bow-tie pasta? You get "Picante Chicken & Pasta" from Weight Watchers'. Don't scoff -- you were never tempted to dump a can of chili over your pasta, just once? 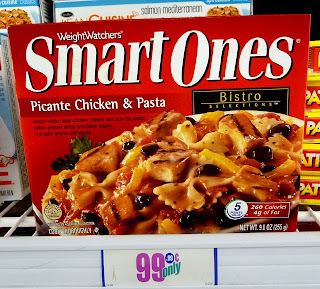 I picked up a couple of these frozen entrees from this 99c only Store and was pleasantly surprised at how tasty it was. Although not advertised as chili and pasta, it is. The sauce is a light variation made with black beans, cubes of white meat chicken, bell pepper, onions, and held together in a pleasant tasting tomato sauce with a subtle ancho chile pepper heat, and you know how this chef likes entrees with chiles. 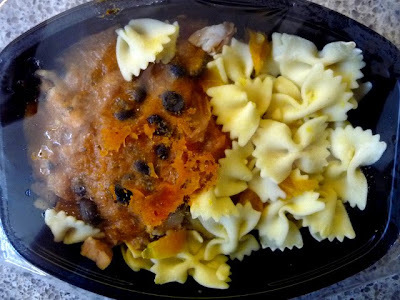 The bow-tie pasta was good; the black beans were firm not mushy; the chicken was real, not processed, and the veggies were chunky enough to be recognizable. The serving is small, just 9 ounces, but that is expected when dining on weight loss fare. 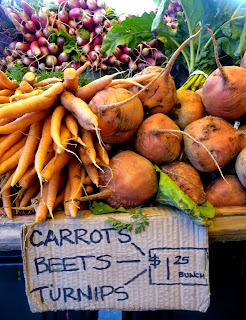 This is a great Deal of the Day, and the price is a quarter of what is found at regular markets. Maybe the idea of chili and pasta is a turn-off -- so is that why this entree ended up in a discount market? Anyway, on a scale of 1 to 9, 9 being best, I give it a 7. I feel guilty for taking off a point for quantity -- why are the servings so small? I'm not asking for a pound of pasta -- just a couple of ounces more would satisfy. This frozen budget entree is quick to prepare, has a good mix of decent-quality ingredients and, of course, low calorie. I'll get a basketful, for a week of work lunches, next time I see it at The 99c only Stores. 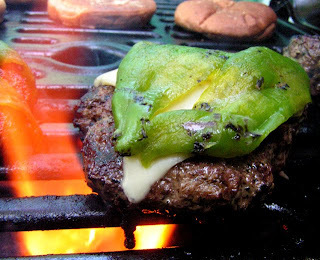 Roasted green chile peppers add color and a light spicy heat to the typical backyard barbecued burger. Much milder than jalepeno or serrano, these Anaheim, Pastilla or Poblano green chile peppers can be added whole to your favorite grilled burger recipe. 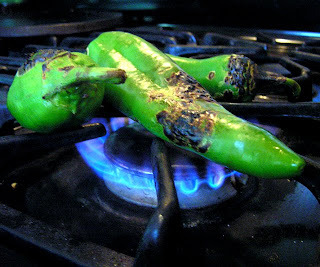 Roasting green chiles brings out a level of sweetness that complements their mild heat. 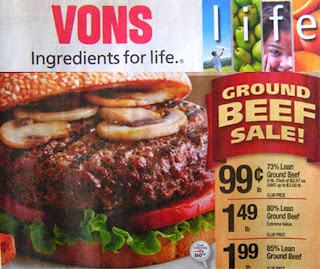 A couple of times during this summer, our local grocery chains have had beef ground meat on sale in 5 lb. tubes for 99 cents per pound, when using their "savings card." The Chef jumped at the opportunity to grill beef burgers, instead of his typical poultry burgers of ground turkey and chicken. The Chef's Roasted Green Chile Burger is a tasty change of pace to typical summer grilled fare and it packs a spicy punch. 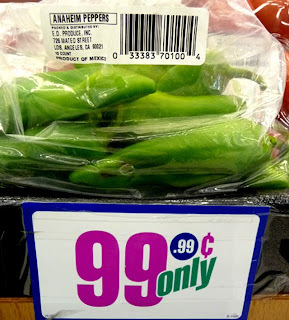 The 99 Cent Chef likes all kinds of chiles and they are in his price bracket! I find them on sale at my local Latin market, and frequently at 99c only Stores. You can buy a package or just a couple chiles for a single serving. 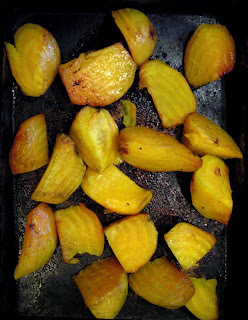 Once they are roasted you can add into omelets, salsa, or your favorite Mexican dishes. 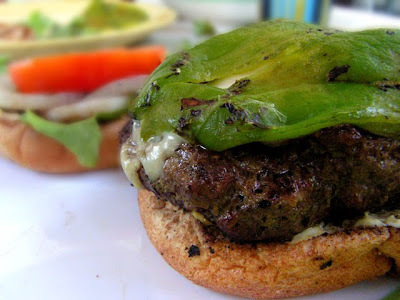 1 or 2 green chiles per burger - I used Anaheim, but Pastilla or Poblano are just as good. Sizes vary, but 4-inch chiles are average. Season your burger as you like it. Toppings include: lettuce, tomato, onion and cheese. Blacken chiles on a gas stove top or an outdoor grill (for an electric stove heat chiles in a pan to char skin). Toast and blacken skin of chiles directly on the metal gas grates, over a high to medium flame. Tongs work best for turning chiles. You need to watch closely and turn frequently to char all sides. Make sure to open the windows as it will get a little smokey in the kitchen and you don't want the smoke alarm to go off ! 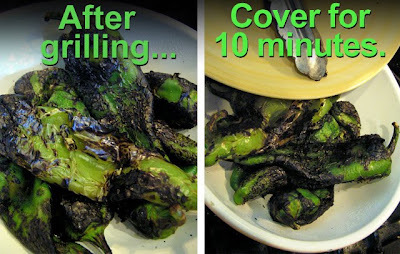 Put chiles in a bowl and cover as you cook them in batches. When all chiles are charred, cover the bowl with a plate, and let them sit for about 10 minutes. The dissipating heat will steam-loosen the skins for easy removal. After about 10 minutes, uncover and fill bowl with water. The skins should slide off as you rinse them off. You may need to give each chile pepper a final rinse under running water to get the blackened bits off. Don't worry about removing all the green and blackened skin - it's extra flavor! On your cutting board, slice off each chile stem and split them down the middle, lengthwise, and remove seeds and any stringy membrane from inside each chile. They are now ready to add to your grilling hamburger! I add them when one side of the burger is done, and top with cheese at the last minute. You can add the roasted chiles whole, in strips or chopped. Any leftover cooked and chopped chiles spice up your favorite salsa, beans, tacos or burritos. Put some in a blender for a smoky green salsa. How about a spicy chile/cheese omelet or egg scramble the next morning?